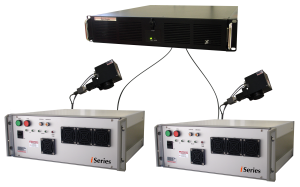 The i-Series Fiber laser marking and engraving system OEM kit series is the most advanced, reliable, industrial-grade OEM laser marking kit available on the market today offered in both single and dual head configurations. The iSeries Fiber Laser kit was specifically designed for maintenance-free OEM applications designed to operate under high shock, vibration and dust conditions under relatively high humidity and temperatures. i-Series OEM Fiber laser marking kits are available in both a Q-Switch or CW configurations in wattages of 10W, 20W, 30W, 50W and 100W. Higher wattages available. The kit is a Fiber-to-fiber architecture which means a robust, monolithic design with no optics to align or maintain, no mechanics to stabilize, and with the focusable power and high power densities needed for the most demanding applications. They do not require routine replacement of parts or material only requiring a low voltage power source. It delivers a diffraction limited (M2<1.05) laser beam directly to the worksite via a metal sheathed single mode fiber cable. The i-Series OEM laser marking kit includes an integrated assembly containing the laser, laser control and power supply along with a Galvo scan-head connected with a fiber cable and includes the company’s flagship FiberScanC3 software. 3D Dynamic Focusing System option now available. For a master-slave configuration (two scanning heads), the speed of the marking process doubles addressing large quantity applications with the same pattern.